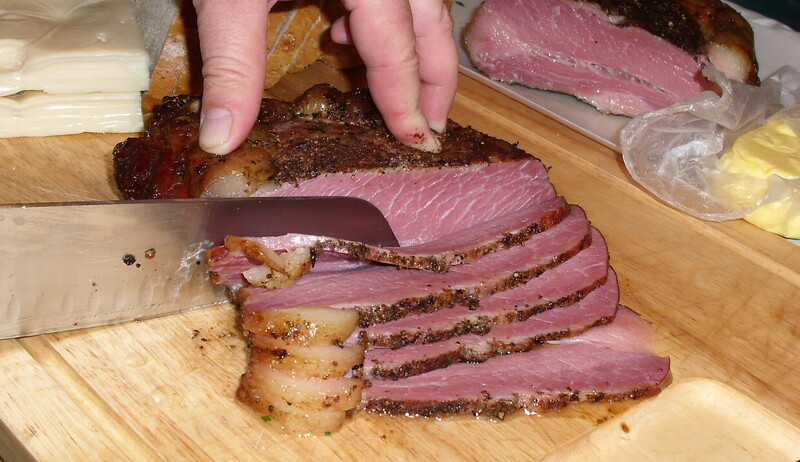 Pastrami or Corned Beef? Either way, it’s delicious! We’d purchased a half cow and as I unloaded the packets of meat into our freezer from my giant ice chest (beer cooler is the proper nomenclature hereabout) I came across the brisket. While providing cutting instructions to the butcher, I mentioned that I was especially interested in a nice center cut brisket because I wanted to make pastrami. She thought that was interesting and I ended up with a nice, fatty, well-marbled hunk of beef, perfect for pastrami. 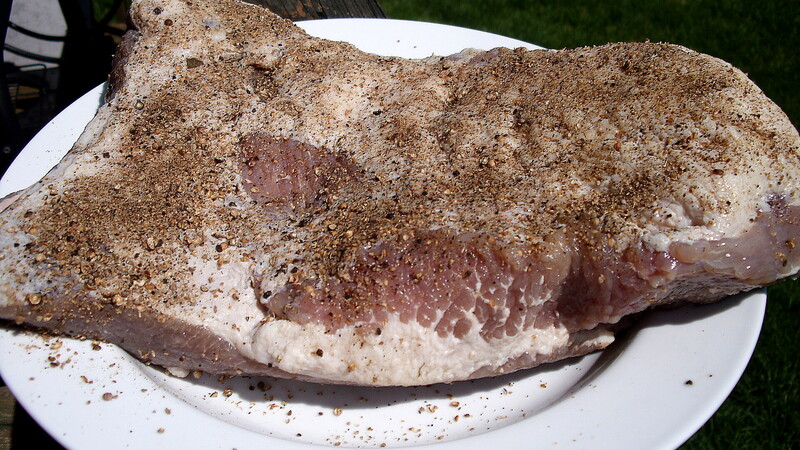 I’d already brined, simmered and roasted corned beef and was so impressed with the results that I had to try pastrami and learn more about these two methods of preserving the same cut of meat. What’s the difference? Well, using recipes from the Charcuterie book the brines are a bit different, the pastrami brine contains more ingredients, it sits in brine for less time and is hot-smoked (best if done for a long time slowly getting up to temp) versus simmered on the stove as is the corned beef. 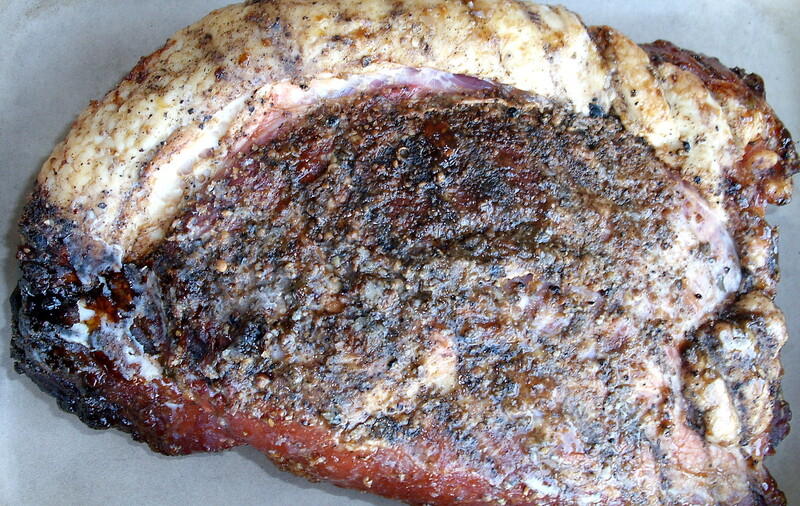 Along with the hot smoke, the pastrami is covered in a coriander/pepper crust and prior to eating, it should be slow roasted in the oven at low heat over a water bath to reheat and re-hydrate it. Heck yeah, we made Reuben’s! We slathered the sliced bread on one side with butter placing it face down on a preheated pan. Stack the cheese, pastrami, sauerkraut as thickly as you’d like and put a nice dollop of dressing on top. I added another slice of Swiss cheese to melt into everything and hold it all together. Top with another slice of bread, buttered on the outside. 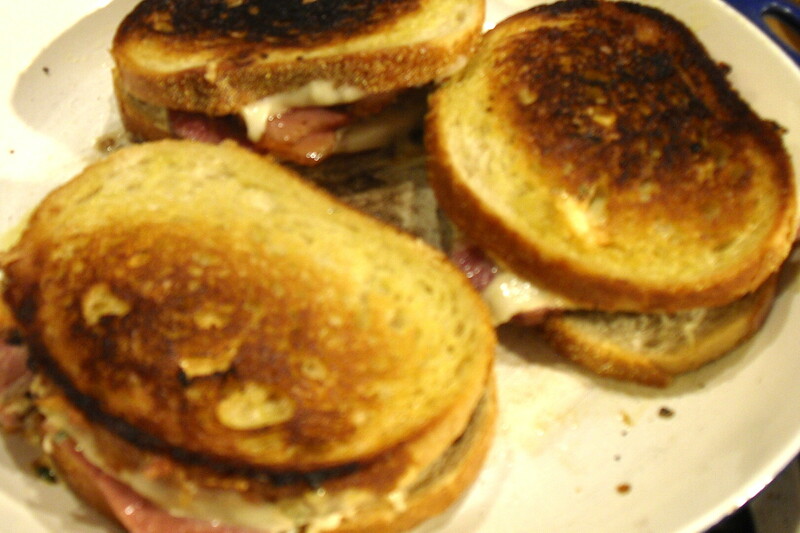 Grill sandwiches to a light brown (mine were too dark but still very edible). A neighbor of mine has perfected homemade caraway rye bread and also ferments cabbage to make his own sauerkraut. I might be able to talk him into making some Swiss cheese too. I hope to visit him and write a post about all of the wonderful food he creates… This guy is an expert Breadmaker and Cheesemonger. Maybe if I make some more Pastrami he’d be willing to trade for some bread and cheese… This is the beauty of eating locally and getting to know all of your neighbors! The ability to source quality meats (humanely raised) allows the freedom to make all kinds of amazing preserved food that prior to joining the Charcuterie Challenge I may never have tried. The rewards are hugely empowering and the flavor is hands-down amazing. Once you try the recipe, it’s easy to play with the spices and flavors to your own taste. I never thought I could make pastrami or bacon and now that I have the know-how it has opened up all kinds of possibilities in my kitchen – no longer am I dependent on the deli… And as they say, if you start with the best ingredients you will end up with the best food. To that end, learning to make my own pickling spice is next, I have a feeling I’ll be using a lot of it this summer.